The Toronto Traditional Mass Society is organising three Latin Masses according to the Roman Missal of 1962. All three are at St. Mary's Polish Roman Catholic Church on Davenport Road in Toronto. While parking is always difficult at St. Mary's all three of these are on Saturdays making parking a lot easier. 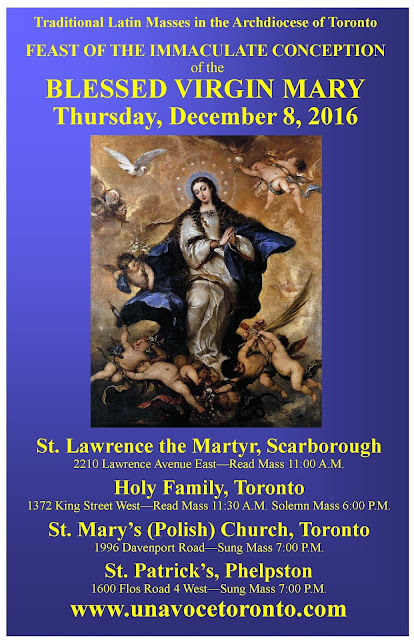 We begin on Saturday, December 8 at 9:00AM with the Feast of the Immaculate Conception of the Blessed Virgin Mary. 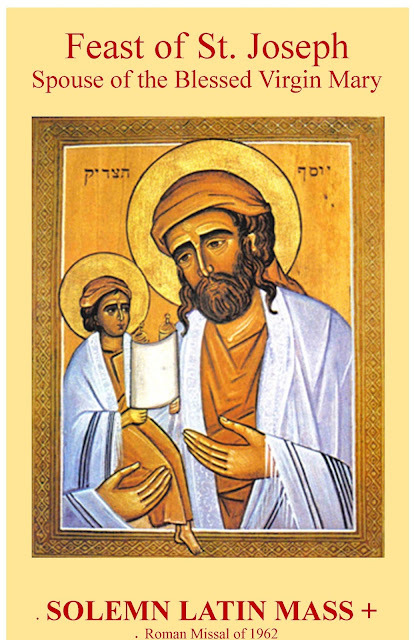 Holy Family will have a Read Mass at 8:30AM and St. Lawrence the Martyr at 10:00AM. 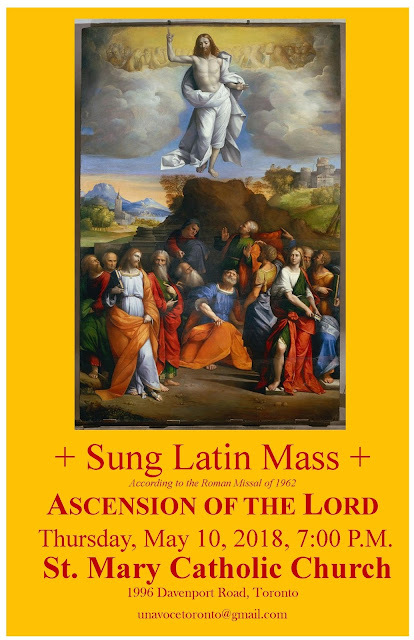 The Latin Mass is offered every Saturday at 9:00AM at St. Mary's except for the First Saturday of the month. 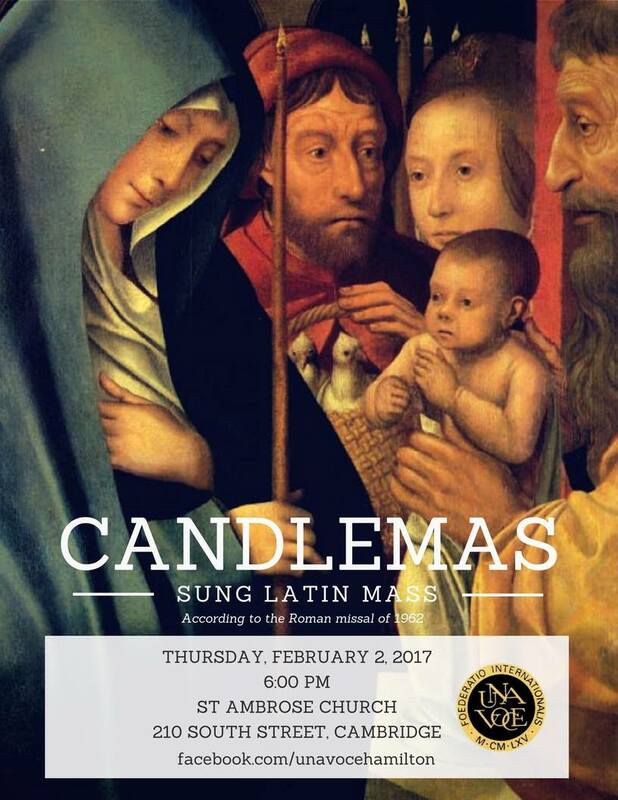 This will be the only Sung Mass of the three. 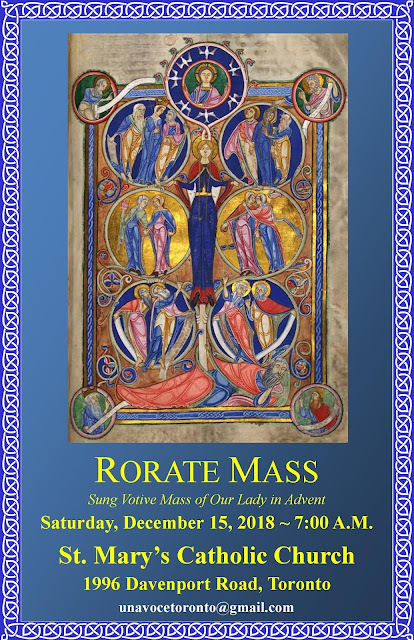 On Saturday, December 15, the Votive Mass of Our Lady In Advent, also known as the Rorate Mass from the first word of the Introit will be offered at 7:00AM. Tradition is that the Mass begins in the early morning hours before dawn and ends as the sun breaks, from darkness into light. Finally, on Saturday, December 22 at 9:00AM, the Mass will be for the Ember Saturday in Advent with its multiple prophetic Lessons and Graduals and the Canticle of the Three Children. As a note, a Sung Mass will be held at 9:00AM on the Second Day of Christmas for the Feast of the Protomartyr, St. Stephen. 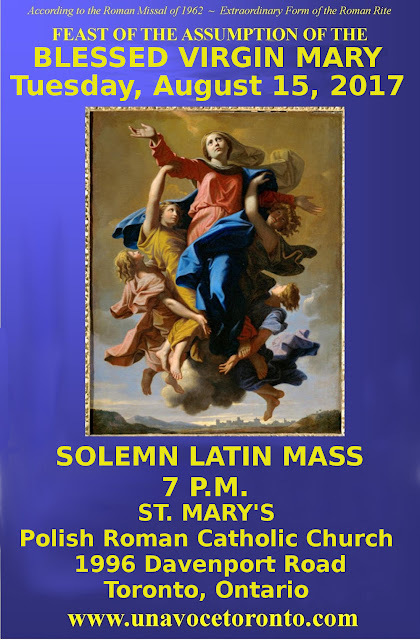 The Traditional Latin Mass returns to Saint John, New Brunswick! 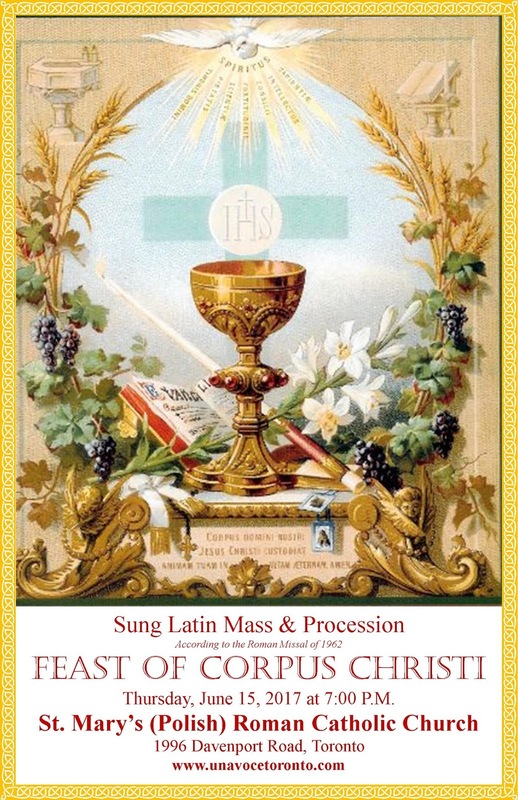 This coming Sunday, October 29, the Feast of Christ the King, the traditional Latin Mass returns to Saint John, New Brunswick. Holy Trinity Catholic Church is located at 348 Rockland Road and the Pastor is Father Peter Melanson ordained to the priesthood just a few years ago. The Mass will be a Read, or Low Mass with organ music and hymns. Catholics of Saint John and the surrounding area are urged to attend and show support by means of prayers, presence and filling the collection basket. May God bless this community, its Pastor and the many Catholics who came forward requesting the offering of the Holy Mass under the provisions of Summorum Pontificum. The question of the qualifications for the Subdeacon in a Solemn Mass continue to be raised and the need for clarity is important. Some are very confused, there is no need to be. The Subdeacon was abolished along with the minor orders of Porter and Exorcist by Paul VI. The Lector and Acolyte were retained and part of the process of seminarian development on the journey to the priesthood. The clerical state does not formally begin until the Diaconate. The vision of Paul VI was that since the Subdeacon was not formally the clerical ordained state, it was still, technically speaking, a layperson. A seminarian is still today, a layman until diaconal ordination. Paul VI left open the possibility, and perhaps hope, that lay people would be formally "instituted" as Lectors and Acolytes for parish life. This has happened in the Diocese of Lincoln and as far as we can tell, nowhere else. During the period of the traditional Mass growth under the old "indults" of Pope John Paul II, the Subdeacon was not a particular pressing issue. The Mass was generally celebrated as a Read, or Low Mass and sometimes sung. This is particularly true outside the Priestly Fraternity of St. Peter and even in their case, outside their seminary or large parishes, they would not have generally offered Solemn Mass. 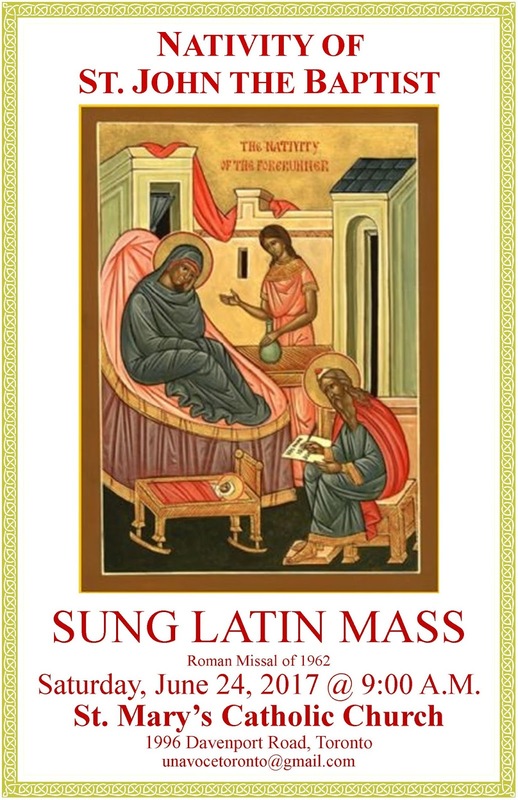 Let us be clear, the Mass should always be Solemn, the Sung Mass and Read Mass came about as exceptions. 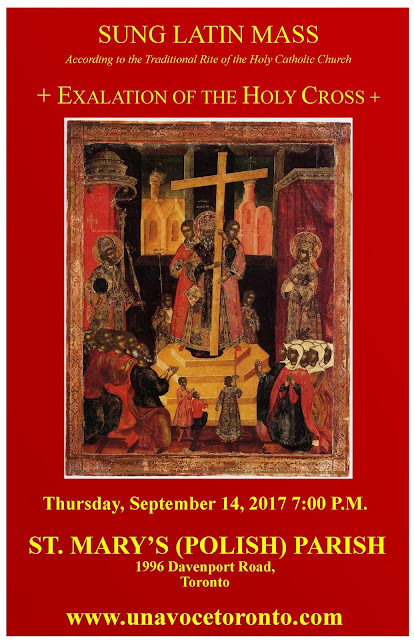 A decade now after Summorum Pontificum we've seen much growth of the traditional Mass and the desire for people to have Solemn Mass. 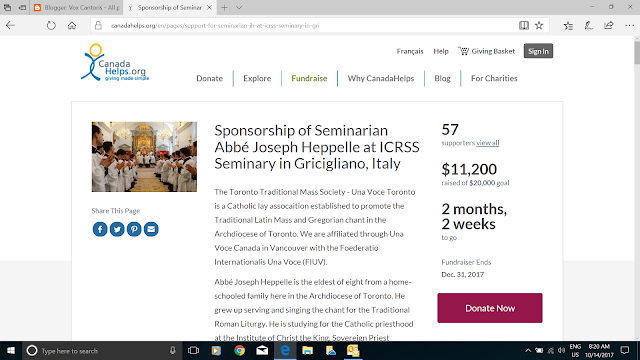 Now here is where we get into a problem and what can be called a creeping modernism by those influenced by the ever changing liturgical dynamic of most parishes and the options of the revised modernist Roman Missal. 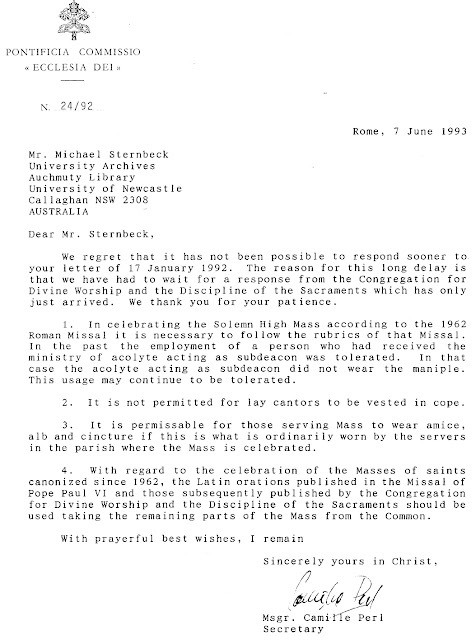 After 1962, an option was created for a "semi-solemn" Mass with a deacon undertaking the sub deacon responsibilities. There also began, after 1965, an abhorrent thing called a "straw" Subdeacon, a layman, without maniple and with some other changes, serving as such. 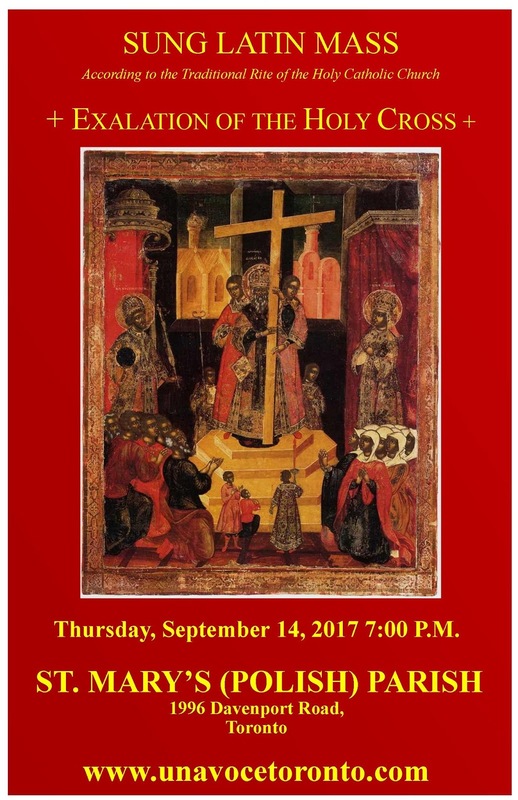 After Summorum Pontificum, this practice began to take hold again. 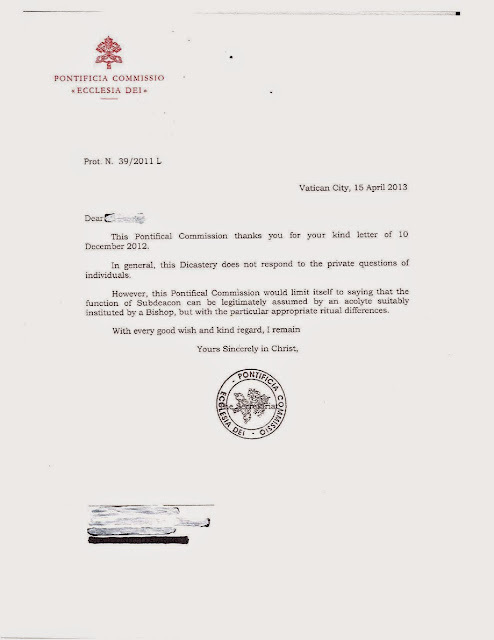 After questions, the Congregation for the Discipline of the Sacraments issued a statement that those men "clothed" in seminary, could fulfil the duties. This was fairly and legitimately given broad interpretation. What did "clothed" mean? For a short period of time then, it was tolerated for a seminarian to serve as Subdeacon. In 2013, a formal instruction was issued prohibiting this. The Subdeacon, could be in seminary or theoretically, could be a married man with a family, but he must be a formally Instituted Lector and an Instituted Acolyte. It behooves everyone associated with working toward liturgical restoration and involvement in the traditional Latin Mass to follow what is expected. The great danger is for incrementalism or "gradualism" and the "novus ordo mentality" to take hold within the traditional Latin Mass. 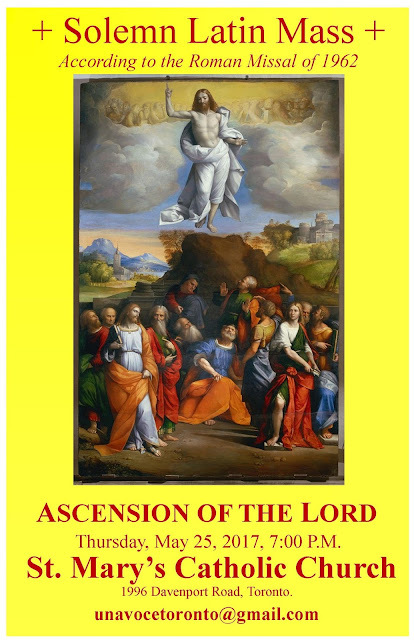 It must be resisted and rebuked at every turn whether globally with the suggestion of the new lectionary supplanting the traditional to the local level and parishes or groups of people who associate together for the purpose of organising a Mass. There is no such thing as a "straw Subdeacon." It does not exist, those who insist it does and that any layman, including a seminarian not formally instituted are wrong. If it is not possible to properly offer a Solemn Mass in accord with the rubrics and norms it should simply not be done and a Sung Mass should be done it its place. There is a duty of those who purport to be authorities or put themselves forward as having some depth of knowledge and authority over the liturgy and to instruct with clarity and truth. 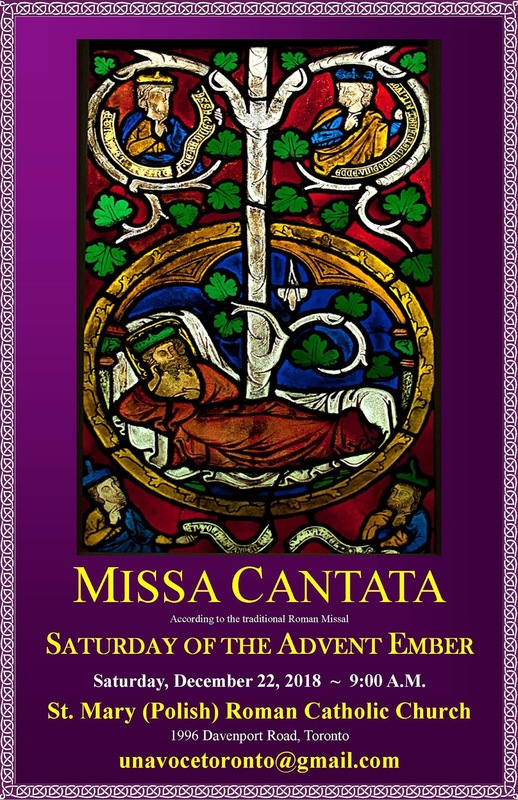 In the Diocese of London, a Missa Cantata will be offered at 6:00PM at Holy Angels in St. Thomas. May 13 is the 100th anniversary of the appearance of the Mother of Our Lord Jesus Christ, the Mother of God at Fatima, Portugal. In the traditional calendar, May 13 is the Feast (3rd class) of St. Robert Bellarmine. In the new calendar for the Novus Ordo Missae, it is the "Optional Memorial" of Our Lady of Fatima. An "Optional Memorial" is just that, the priest can choose the text for Our Lady of Fatima or the Ferial. The traditional calendar was never updated liturgically to recognise the appearance of Our Lady at Fatima. In the Motu Proprio Summorum Pontificum, Pope Benedict XVI made possible the updating of the traditional Mass calendar of 1961 to include more current feasts and saints. 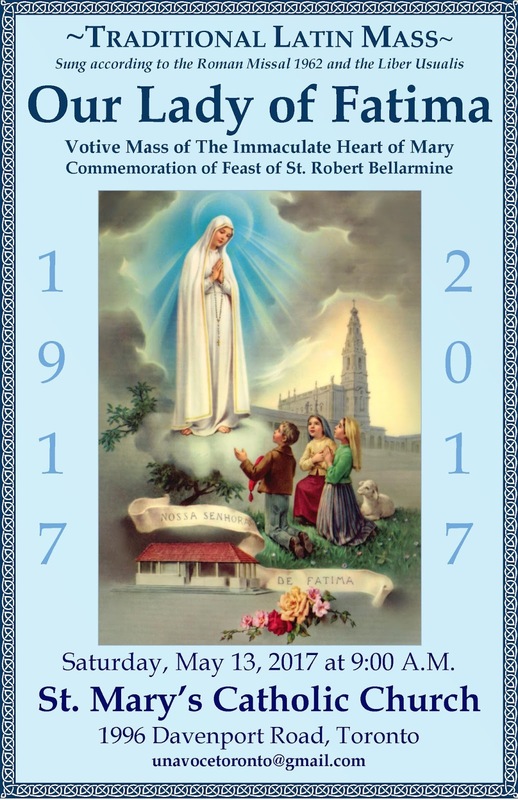 Recently, the Pontifical Council Ecclesia Dei in the Congregation of the Doctrine of the Faith decreed that Our Lady of Fatima could be celebrated on May 13 in the traditional Mass. How appropriate then that the first change should be for Our Lady and in 2017, to recognise the 100th anniversary of her appearance at Fatima. The text of the Mass is the Votive Mass of the Immaculate Heart of Mary (August 22) with the double Alleluia for Paschaltide. The feast of St. Robert Bellarmine will be commemorated, meaning the Collect, Secret and Postcommunion will be doubled to include those from both Masses. Una Voce Toronto is very grateful to the pastor and parish of St. Mary's Polish Roman Catholic Church for the opportunity to celebrate this great day. We ask you to be generous at the collection as the funds will be used by the parish for sanctuary renovations. 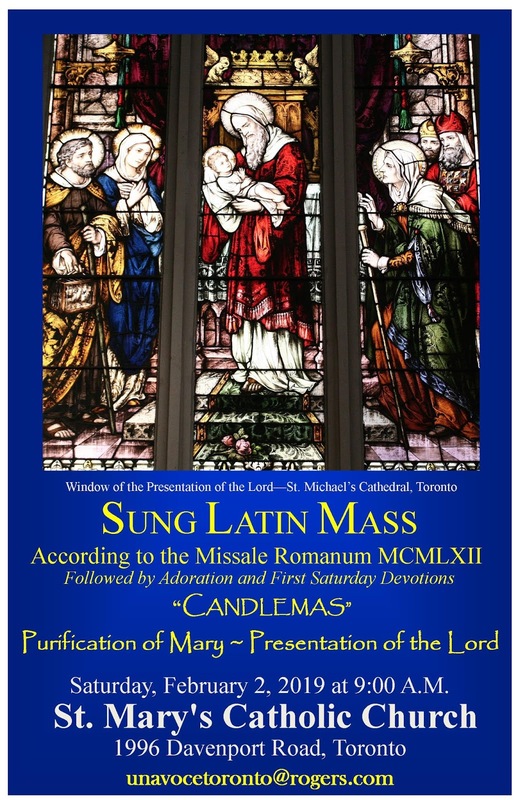 FIRST TRADITIONAL LATIN MASS IN BARRIE IN OVER 50 YEARS! 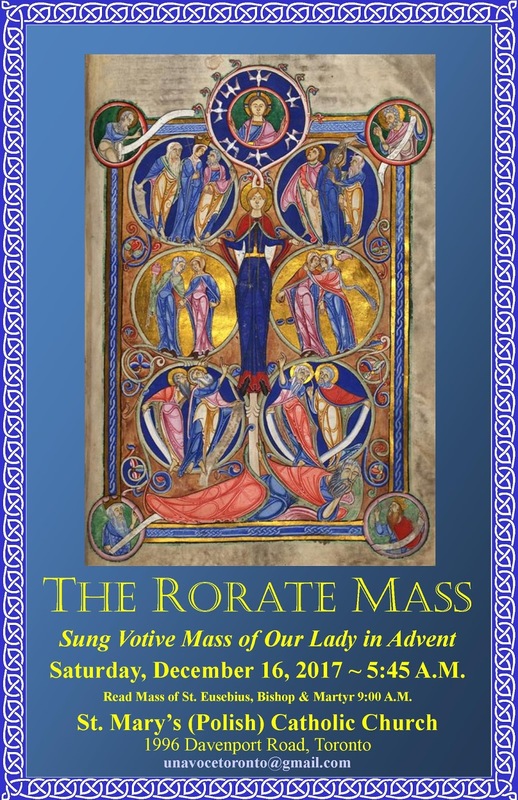 Let us review some terms and basic rubrics for the Traditional Latin Mass, also known in modernist terms as the Extraordinary Form of the Roman Rite. There is charity in truth and there is peace and unity in truth. There is no charity in silence and appeasement. 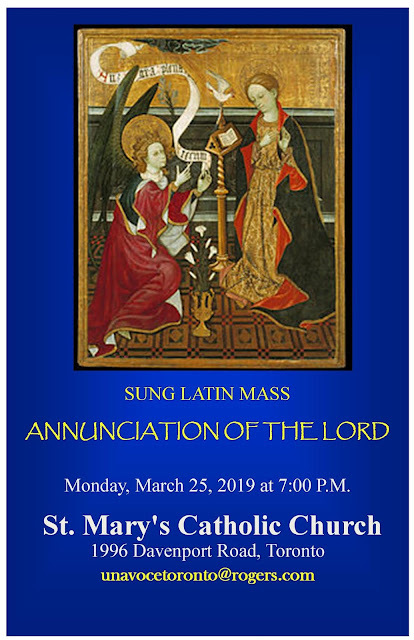 Commonly referred to as “Low” Mass, the Mass is more properly referred to as a “Read Mass.” This comes from its Latin name, Missa Lecta. The Mass, in history, would have always been Solemn (see below), but as parishes and villages developed away from monasteries and cathedrals; and as mendicant Orders journeyed to preach, priests would desire to offer the Holy Sacrifice for themselves and the souls they found on their journeys. The Missa Lecta was developed for this purpose. 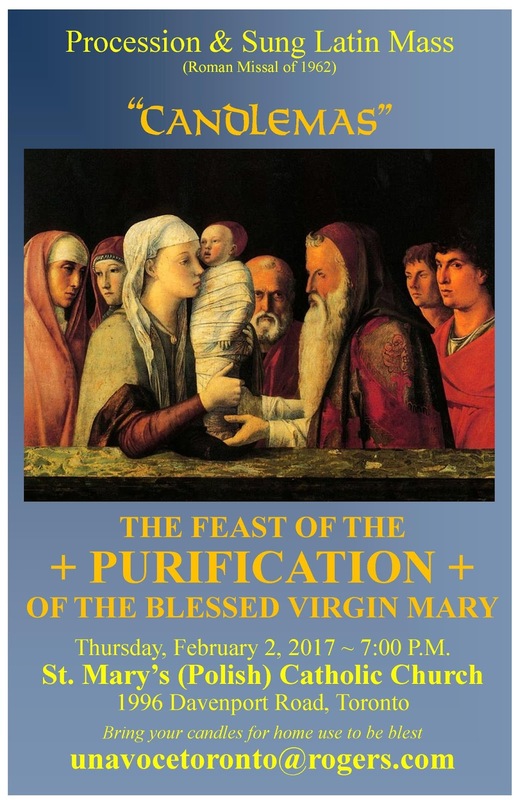 It is a quiet and contemplative Mass with one server only, though two can be “tolerated.” The Mass is entirely in Latin, though, in accord with the legitimate Law as prescribed by Pope Benedict XVI, in Universae Ecclesiae the Lesson(s), Epistle and Gospel may be said in the vernacular from an approved translation at the time (1962) from the Altar without first being read in Latin. There is normally no music permitted. Music is not permitted in a Read Mass except in specific circumstances. In fact, a more proper word than permitted would be tolerated, in its classic sense. 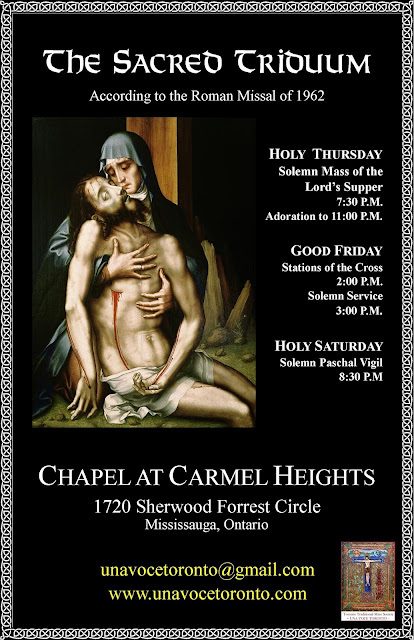 One may have an organ prelude or postlude and organ music at the Offertory or during Communion in those times of the year where organ music is not prohibited. 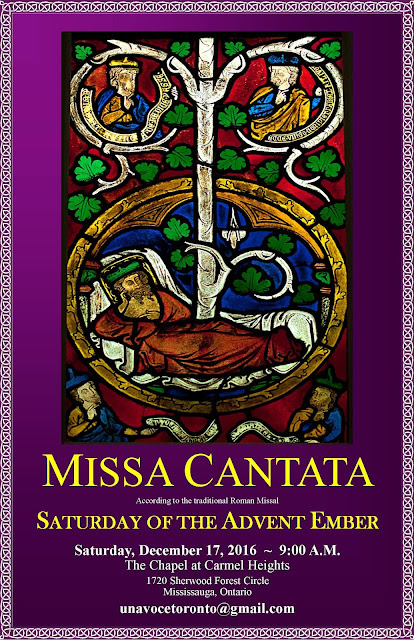 No solo organ music is permitted in the Mass during Advent, except on Gaudete Sunday or in the season of Lent on Laetare Sunday. No solo organ music is permitted under anytime at a Requiem Mass. Organ music may be used at a Requiem Mass only to support the singing and only if absolutely necessary to even do that. Music or, hymn sinning may be used at a Read Mass in the following manner. A hymn may be sung as a processional and the recessional and these may be in the vernacular. A Latin hymn may be sung at the Offertory and the Communion but it may not be the text of the Proper of the Mass which must be read by the priest aloud and heard by the faithful in attendance. A hymn may be sung in the vernacular at the Offertory and Communion provided it is connected with the liturgical action. For example, the Offertory hymn could be, “See Us Lord, About Your Altar,” or, “Lord, Accept the Gifts We Offer.” At Communion, the hymn, if in the vernacular, must be a hymn to the Blessed Sacrament or be a hymn of Thanksgiving. The Gloria and Credo cannot be sung at a Read Mass. 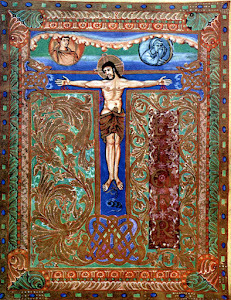 A Kyrie, Sanctus and Agnus Dei may be sung if it is short, for example, Mass XVI or Mass XVIII, never Mass IX per se. All singing must conclude so that the action of the Priest is not delayed and the audible texts are not covered by music. The Priest does not sing the Collect or Postcommunion nor any other oration, nor does he chant in any way the salutations, nor do the people respond in chant. These are only said. All Propers must be sung, there are no exceptions. The Epistle and Gospel must be sung, there are no exceptions. All salutations and response are sung, there are no exceptions. If the priest cannot sing the melismatic tones of the Lesson, Epistle or Gospel, then he can chant them recto tono, on the same note. If the Schola cannot manage to sing the Proper chants with the melisma, then it is permissible to sing them in psalm tone, or recto tono. They can also be sung in Polyphony when considered appropriate. At the Offertory and Communion, Latin motets or hymns can also be sung, but only after the Proper Antiphon. The musical rubrics apply to a Requiem Mass as to the degree above. Holy Mother Church has determined the above rubrics in order to ensure the proper dignity of the Mass. When we work within the Laws of the Church, there is peace and understanding and serene contemplation of the holy actions taking place before us. When we deviate from these for pastoral or other reasons or through pressure, we create confusion and disunity and distress and these are not from the Holy Spirit; we insert our own desired into the liturgy, where it does not belong. None of us are masters of the Liturgy of God, we are the servants. We must do our work in truth and humility, we must submit to the mind of the Church and we must reject any inculturation and pastoral provision that deviates from the truth. At no time is a guitar permitted during a Traditional Latin Mass. At no time is it permitted to sing anything in the vernacular in a Sung or Solemn Mass. Any reference to what occurred between the great wars in Europe in Germany, Belgium or Holland should be understood in the context of dissent and diabolical disorientation that lead to the complete upheaval of the holy liturgy. Lest one doubt the above. Be assured that every educated Catholic in proper Church music and liturgy according to its venerable tradition is aware of these rubrics and knows where to find the sources. Let those who labour for the love of true worship of the LORD in the timeless liturgy understand the need to maintain consistency, peace and serenity in the work before us. This peace and serenity can only be achieved if we work within that which we are given. By humbling ourselves to the timelessness, we will achieve peace in our work. It is when deviations occur that we bring disunity and cognitive dissonance to the holy work before us. 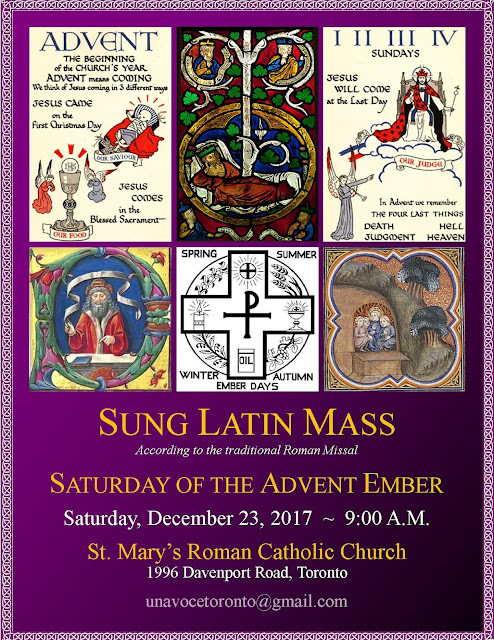 Return to celebration of Advent in Toronto - Get thee to a Traditional Latin Mass! The Toronto Traditional Mass Society - UNA VOCE TORONTO, announces a number of Masses for the Advent season some of which are regularly scheduled, and some which are specifically organised by the Society. 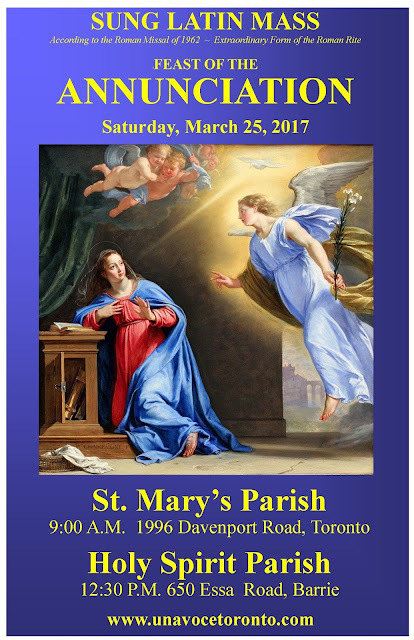 On every Sunday in the Archdiocese of Toronto, there are four Masses offered in the Traditional Rite at diocesan parishes. 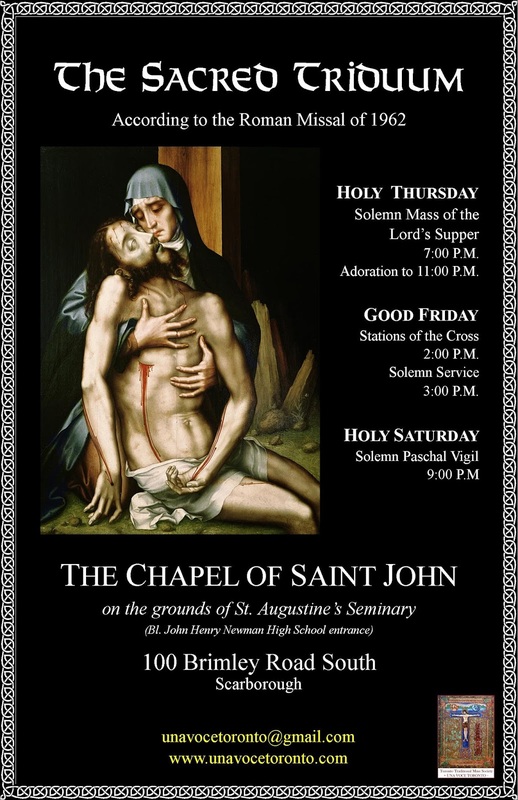 In addition, the Society of St. Pius X offers three Masses at its Toronto Chapel and one in Orillia. There are three particular outside of Sunday to which we draw your attention. 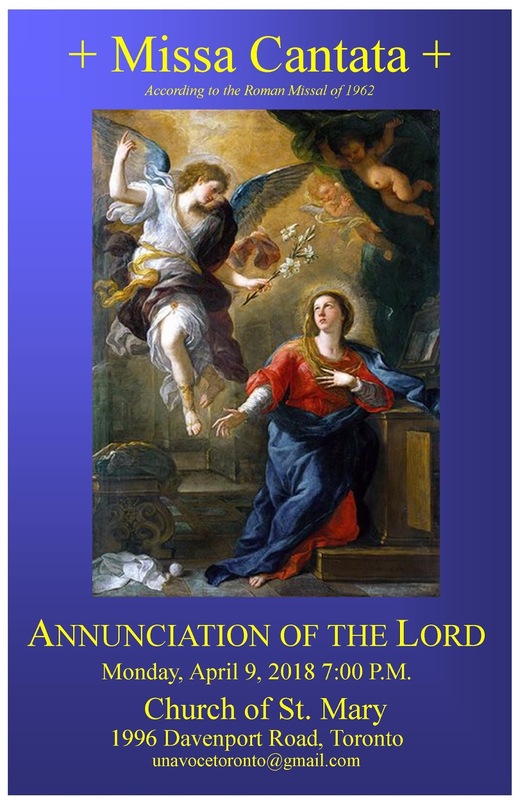 This coming Thursday, December 8, is the Feast of the Immaculate Conception of the Blessed Virgin Mary. 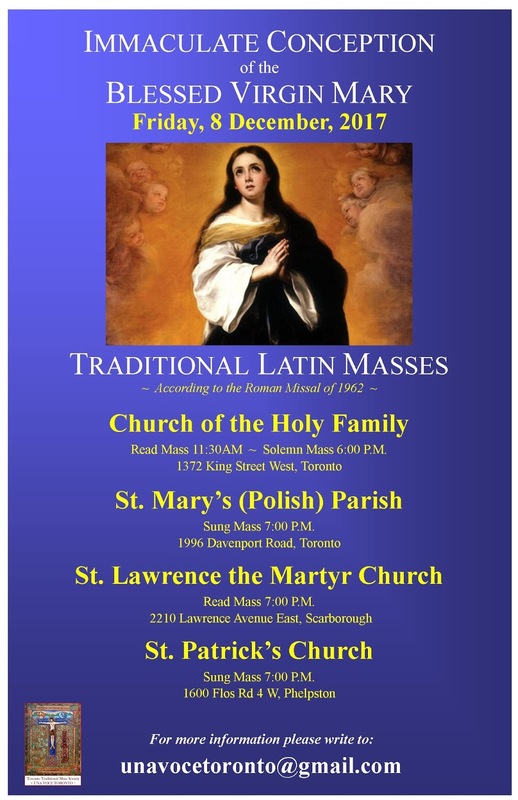 There will be varied traditional Mass locations in diocesan churches in Toronto plus the SSPX. Two more that you should note and attend. 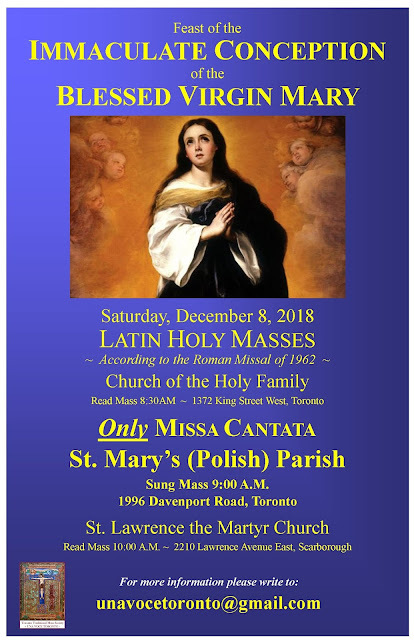 Saturday, December 10 at 9:00 A.M. at St. Mary's Polish Roman Catholic Church on Davenport Road in Toronto; a Read Rorate Mass with Music. While the old "custom" was to start before daybreak, that is not a liturgical rubric. The pastor at the parish offers the traditional Mass every Saturday at 9:00 A.M. and will offer here, the Votive Mass for Our Lady in Advent. 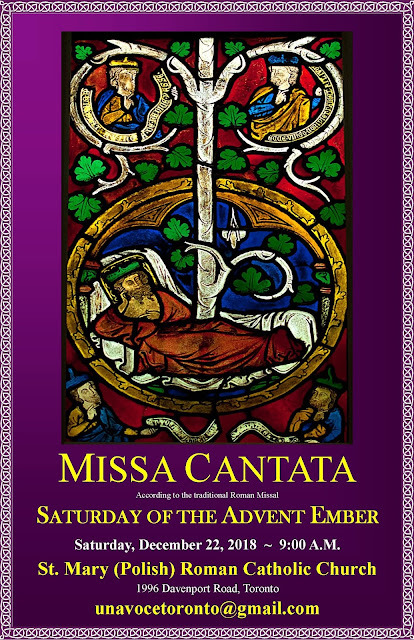 The next Saturday, December 17, is the Ember. There will be a Sung Mass at the Carmel in Mississauga. An incredible liturgy that is rarely, if every sung with its multiple Lessons and Graduals culminating in the sung Canticle of the Three Children from the fiery furnace in Babylon. Leave the shopping. Leave the insanity of our secular and grotesque and hostile Toronto. 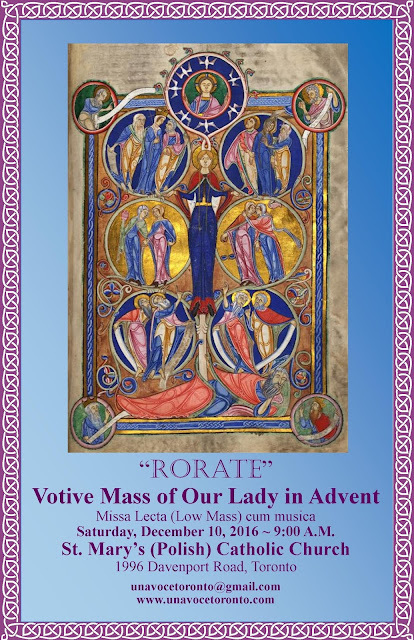 Get thee to a Latin Mass and get back to God this Advent!